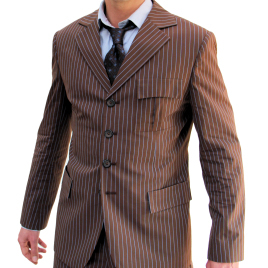 Newly arrived in the mail today was my Tennant Brown with blue suit, in a word- Brilliant! The fit is amazing and the quality of the work astounding. Indy has done a brilliant job capturing the look and style of the iconic look- I did have some misgivings about whether it would be a purely 'fun' item of clothing and look out of place in everyday life, but to be perfectly honest its better than what you'd find in most stores here in Canberra. Cannot reccomend this craftsman and his product highly enough.